Jaguar Land Rover to use 21700 cylindrical cells. According to Korea Times, Samsung SDI will supply lithium-ion batteries for future Jaguar Land Rover electric cars. Currently, the Jaguar I-PACE is equipped with pouch cells from LG Chem, but it seems that JLR intends to try out Samsung SDI and the cylindrical type of cells, the new 21700 format used by Tesla in the Model 3. The cylindrical type apparently will be produced at the European factory in Hungary, although Samsung SDI first needs to install a new production line for the 21700. The Jaguar I-PACE is assembled near, in Austria – it’s not yet known where the new models will be made. 5 GWh of cell production would be big jump for Samsung SDI. Such amount of batteries would be enough for more than 55,000 90 kWh packs (I-PACE size). 56 Comments on "Jaguar Inks Deals With Samsung SDI For Cylindrical 21700 Battery Cells"
This seems to be a confidence vote in favor of Tesla’s battery cells technical option (cylindrical cells). My thoughts exactly. Simplistic approach just works and cost effective. 2170 is about the right cell size, but I don’t recommend copying Tesla’s current module design. Far too difficult to manufacture. Quoting Elon and everyone that was called a “short” just before the Lord himself admits that the design is just overly complex. Find us any EV that is produced in bigger numbers and we will talk. Gosh yes, how awful that Tesla is now selling more “far too difficult to manufacture” EVs than any other auto maker, even in China. The issue with Tesla’s design is the number of cells involved – thousands vs. hundreds with pouch cells. It fails the KISS ideology. But I admit it works for Tesla. But, I still don’t see the large manufactures going down that route. It just adds complexity and potential warranty nightmares. I agree. There are thousands of electrical connections using 2170 cells compared with hundreds using large pouch cells, each of which could corrode, fail, etc. However, the failure of a 2170 cell connection has much less serious consequences than the failure of a large pouch cell connection. Thousands of metal cans containing 2170 cells must make a certain capacity of these cells weigh considerably more than the same capacity of large pouch cells. A pack of cylindrical cells is likely larger than a pack of rectangular pouch cells due to the space wasted packing cylinders in a rectangular volume. A big advantage of using thousands of small capacity cells is that packs of various capacities could be built by connecting different numbers of strings of cells in parallel thus maintaining the packs output voltage. This is less possible using larger capacity cells. Exactly the other way around : The cylindrical 18650 and even more so 21700 cells are using only half the volume as typical pouch cells like used for example Nissan Leaf-2. The pouch cells need some metal box casing to keep them in shape, adding more weight. And the Mercedes EQ is ridiculed by some Tesla fans here for ‘old technology’ because their pouch cell packs for 80 KWh (net) are weighing 650kg. In 2015 the Austrian company ‘Kreisel Electric’ was replacing the old E-Golf pouch pack (24 KWh) with 18650 (still the 3300 mAh) to fit a 55 KWH pack into the same old battery space. On ‘Electrek’ blog today there is a post about a company in Germany ‘Lion Smart’ who is using the Kreisel idea of laser-welding single cells together and drown those into a non burnable isolating liquid (some kind of transformer oil ??). ‘Lion Smart’ could replace the BMW i3 pouch pack with 21700 cells and fit 100 KWh inside an BMW i3 good for 700km (435 miles). Right! The weight that pouch cells lose from the lack of a rigid case, is more than made up for the fact that they have to be fastened or glued into a rigid frame to hold them in place. e-Golf is using prismatic can cells, not pouch cells. The main reason for the big differences in densities is that these large automotive cells tend to use outdated technology… With the same chemistry etc., the density difference at pack level between different cell formats is minor. Different shapes if nothing else will require differently shaped cooling system, and it being equally sized and equally weighted regardless of shape strikes me as quite a tough sell. Yup. Tesla’s battery cooling system is far simpler (and no doubt less expensive), with fewer parts, than the cooling system used in the Chevy Volt and Bolt EV. Altho using smaller cells does require more electrical connections and fuses (or “fusible links), there are also multiple advantages to using smaller cylindrical cells in a metal “can”. I don’t entirely trust their conclusions regarding the precise trade-offs, since they are using a bunch of wrong or somewhat arbitrary assumptions; but nothing too major I think — so the general trend should be right. That would be true if geometry was the only factor in play. In reality, using smaller cylindrical cells lets Panasonic make cells with higher energy density than is found in pouch cells, packing more energy into smaller cells; and the space between cylindrical cells helps prevent waste heat from building up to dangerous levels. Pack pouch cells side-by-side, and you need to transfer more heat away from the interior of the pack. Several InsideEVs articles have praised the ability of GM’s battery cooling system, allowing it to transfer heat out of the Bolt EV’s pack faster than heat transfer out of a Tesla pack. But that more powerful cooling system is also more complex and more expensive. Tesla gets away with using a far simpler — and almost certainly much less expensive — cooling system, partly because of the cylindrical shape of its cells. The space between the cylindrical cells does *not* help in cooling — at least not with Tesla’s design. (It might be different with immersed cells I guess.) The actual trade-offs are more complex than that. Well of course it helps. It’s basic physics; heat radiates away from the sides of round cells where there is a space between them, but can’t where flat-sided cells are packed closely side-by-side. Space between the cells, and far less surface area in contact between them, also helps prevent runaway overheating events in one cell from spreading to adjacent cells. If you have any doubt this is true, then read up on the problems Boeing had with fires in its Dreamliner, with a battery pack which had large format block-shaped (prismatic) cells packed together side-by-side. Radiation cooling is negligible in a liquid-cooled design. In the Model 3 pack, the “blue goo” actually *prevents* heat radiation and convection, while keeping heat conductance low. Isolating fires is an entirely different topic. That’s why I said the trade-offs are more complex. And the packs aren’t larger or heavier, since pouch cells, lacking integral cans, simply need the same sort of mechanic support etc. added outside the cells, as others already pointed out. Well one just did. Tata is a large manufacturer. Eee. Sorry, but KISS have nothing to do with the number of things in the usage. It state that well understood and simple solutions (21700 known to humanity since basically forever) should be considered over complex or convoluted ones (prismatic cells that have to be custom designed for each size of a battery pack). The number of cells doesn’t make the design more complex. While there are many individual connections, they are all very simple and regular — especially in the Model 3 pack design. (And supposedly even more so in future designs?…) The number of different manufacturing steps involved is not larger than with other cell formats — I tend to think it’s in fact probably smaller. These cells are for hybrids not EVs. Jaguar is electrifying its whole lineup. Either way, it doesn’t contradict the original statement. To me, fewer parts are better. Tesla has proven that cylindrical parts can work well, but this also lead to significant delays on the Model 3 production ramp (months). Getting online with pouches likely would have been faster. Now that they have a good technique of making the Model 3 batteries they should be fine. The cans have advantages as well. That’s not very likely. Pouch cells require a rigid framework for support of each cell; Tesla uses plastic sheets with dimples to hold cells in place. Pouch cells stacked side-by-side also need a more complex and more expensive cooling system. Using larger pouch cells or prismatic cells looks better on paper, but in practice it’s Tesla’s approach which has lead to lower battery pack costs. Cylindrical cells are industry standard. Industry. Not even automotive industry. Anybody who do not have to cram cells in whatever space is still left, uses cylindrical cells. It’s pouch shape that’s non standard. If Panasonic/Tesla had trouble with well understood cylindrical shape, then pouch shape that’s custom and require custom equipment would take longer still. The production delays resulted from the enormous volumes pushing them towards higher automation. If they started with a partially manual process, like the similar (but slightly more complicated) Model S/X packs are using — as well as the various pack designs from other makers — most likely there wouldn’t have been any delays. Any indication of when the line will start producing? A year, 2 years? With a configurable battery pack you could work with several form factors. Yes SJC a configurable battery pack for several form factors. If you’re using plate Cooling it doesn’t matter if you’re using cylindrical or rectangular shaped cells. You can even add a top plate if you need extra Cooling. We had an article on that. Likewise Tesla could use their cooling ribbon scheme on rectangular shaped cells. That results in a great pack for rejecting Heat. Samsung has already been making 21700 cells for other products. The form factor is nothing new for the company. The order is definitely significant. Isn’t the 21700 a Panasonic product? Is this licensed production? Is the 21700 design being used as a generic term? Anyone know???? 21700 is just a cell dimension. I has nothing to do with the manufacturer. It’s no different than a C, D, AA, AAA cell battery – it’s just a size. 21700 is just the size of the can. It did exist before Tesla was even founded. Tesla is calling theirs the 2170 for no apparent reason, but it is the same size cell. This is great news, and I am glad to see 50k packs worth of volume, partly because it can’t all be for the iPace!!!! None of it is for the IPace. Tesla is caling their cells after their size. 21 by 70, 21700 (note extra zero) is also synonym, both are in use by industry to distinguish exact same thing from other sizes. 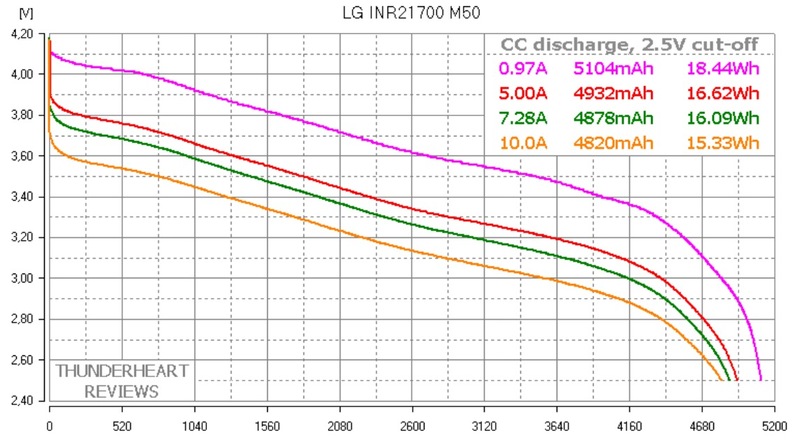 It’s not a specific product from only Panasonic, see attached the spec from LG Chem 5Ah -21700 with 267Wh/kg energy density developped since 2016. Nitpick: Panasonic calls their cell type the “2170”, altho it’s the same dimensions as the 21700. Panasonic just dropped the superfluous final “0”. If Jaguar need those for hybrids, then why, yes it will get high energy, lower energy density cells because cell count will be very low, so each cell have to handle high energy. Jaguar BEVs need the density more because weight becomes a major characteristic with bigger pack, while there will be up to and order of magnitude of cells more, so each individual cell will have to handle much smaller input/output. Nobody knows the exact energy density of the Tesla/Panasonic 21700 cells — though estimations seem to be pretty much in line with the specs posted above. The first 2 digits are the diameter of the cell, digit 3-4 the heights all in mm. So the TS and TX have 18650 (18mm diameter, 65mm height) the TM3 uses 2170(0) cells which have 20% more energy per volume. Most estimations put the Model3 21700(0) cells at pretty much the same energy per volume as 18650. Tesla originally claimed they’d have about 10% improvement; but apparently they chose a different trade-off in the end… Or they aren’t using the cells at their full capacity. It’s one step to have purchase battery cells. BUT to be used in a vehicle; the cells need to be integrated into modules and designed into a systematic package. The power management software is where a lot of the magic lies. If they ordered a large number of cells, they must already be pretty confident they have a working design… It might still need some refinement — but since large cell orders need to be placed in advance, that makes perfect sense. The Toyota Prius used a standard size, NiMH module of six cells. This allowed rebuilding of the earliest traction batteries using more advanced modules from crashed Prius. But it always meant the pack was only as good as the weakest one. In contrast, the blocks of single cells allows one to fail and only reduce the capacity. The car continues to operate safely. Not mentioned is the cell chemistry. The Tesla cells use NCA that minimizes the amount of cobalt, an expensive element. A 21700 cell using traditional NMC will always be more expensive. Subtitle on the main site omits “format” and implies that Samsung’s 21700 used in M3 will be supplied to Jaguar.